﻿ Laminated Shims (Peel Shims, Peel-off Shims, Peelable Shims) manufacturer. LAMÉCO offers the highest performing solutions available, bridging gaps and delivering improved performance to mechanical assemblies across all fields of industry. Our custom engineered laminated shims are precision manufactured from a wide range of metals or utilizing the latest composites, all of which have the property of being easily peelable into micro ﬁne strips only a few microns thick. Our peelable shims guarantee an optimal precision which shim pilings can never deliver, besides which when you switch to peelable shims you no longer need to keep a large inventory of solid shims. Our shims are manufactured to be quickly and easily peeled using scalpel or foreﬁnger; and that’s a real time saver. Using LAMÉCO shims allows an instantaneous compensation for excessive play, or wear and tear, without production stoppages, and helps avoids machine reworking. We offer a very wide choice of laminated materials to exactly correspond to your demanding engineering applications. We manufacture shims in laminated aluminum, brass, stainless steel, steel, titanium, polyimide, polyester, PET, glass fabric and carbon fabric. Neither do we only manufacture flat shims; we also manufacture curved, folded, three dimensional or tapered laminated shims. Doing this makes LAMÉCO unique across the entire industry. 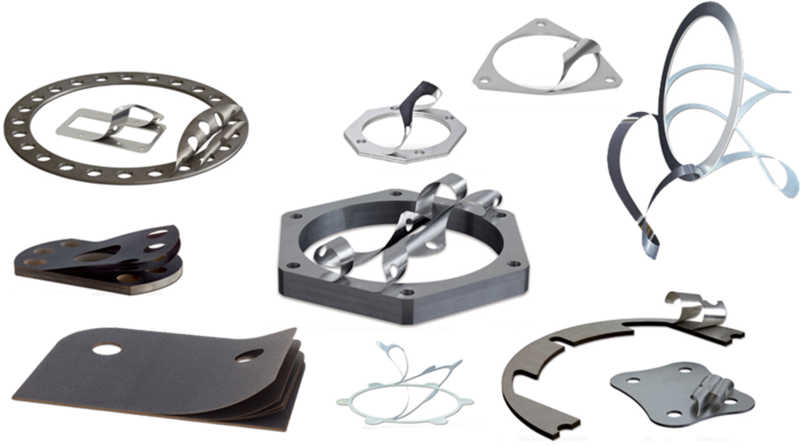 LAMÉCO’s peelable shims provide a perfect ﬁt which no longer requires laborious preshaping before assembly, since they are delivered ready-to-use at the highest and most consistent level of manufactured quality. This advantage is all the more appreciable where thick metallic laminated shims are required, as traditionally they could not be curved or folded manually (even with special tooling) just prior to assembly, in addition our process avoids any risk of delamination and/or breakage at the last moment as can so often occur when shims are shaped under pressure of stoppage. Using our patented shims avoids running the risk of considerable losses of time and/or a reject ratio that may often prove to be prohibitive. Our laminated shims are composed of foils glued across the entire face and not just at the edge. No risk of delamination. An additional benefit of our unique production process is a shim whose mating faces are perfectly parallel and totally free of any burrs - whether made of metal or composite material. Copyright © 1998-2018, Lameco. All rights reserved.